Growing in some of the harshest climate conditions in the remote highlands of China, Mongolia & Tibet and used as natural medicine across Asia for over 3,000 years, Goji berry (Lycium barbarum) has long been known as the “longevity fruit”. Researchers have discovered that Goji is rich in Lycium Barbarum Polysaccharides, potent glycoconjugates responsible for much of Goji’s powerful benefits. These powerful antioxidants are exceptional sources of the essential cell nutrients responsible for proper immune function. These polysaccharides appear to be highly effective in raising the levels of immunoglobulin A (IgA), an immune protein that steadily declines with age. Serving Size: Take one to three oz. daily. 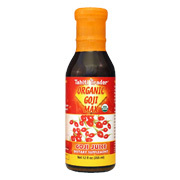 Organic Goji Max - is shipped in a discrete, unmarked package. Orders are processed immediately and usually take about 3 to 5 working days to be received. We do ask that you try it for 2 to 3 weeks to feel the full effects. Any information received is used only for order processing and shipping purposes. Your information, such as e-mail address, will never be disclosed to a third party.